“Breaking stereotypes” was the theme of last week’s Islam Awareness Week activities at the U of M.
The initiative, which was led by the Muslim Student Association (MSA), was mainly held in UMSU University Centre (UC) where the MSA answered questions and distributed free literature on Islam. 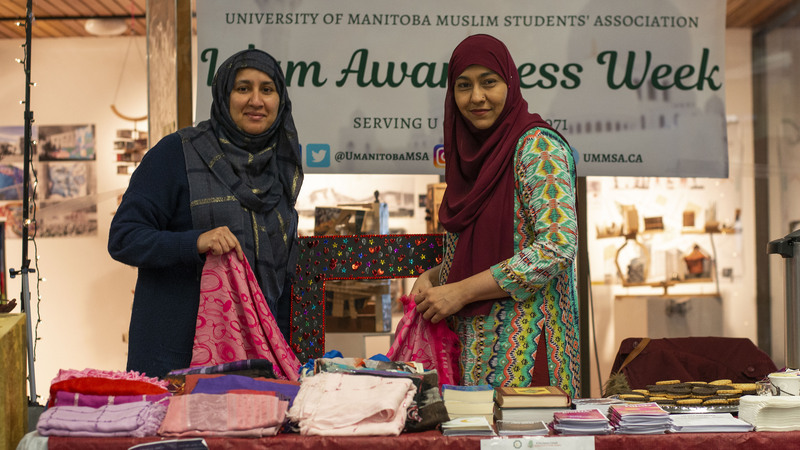 “Islam Awareness Week was an opportunity for members of the on-campus community to meet Muslims, connect with us, and learn a little more about Islam,” she said. Along with tabling in UC, the MSA also hosted a movie night and offered students a tour of the on-campus mosque. The week ended on Feb. 1, which is recognized internationally as World Hijab Day, and the MSA celebrated by partnering with the Islamic Circle of North America (ICNA) Sisters Canada group for a hijab try-on session for anyone interested. Awan said the activity was a fun way to relay an important message. “Anyone who was interested in seeing what they looked like in a hijab — both men and women — was able to do so and take a scarf home for free,” she said. The MSA’s goal, Awan said, was to reach out to the wider campus community and provide people with an alternative view of Islam to what they may receive from other sources. “We hope students learned that their Muslim counterparts are just like them, we study the same things, wear similar clothing, and enjoy the same food — we also adopt many of the same values that the average Canadian has, especially in considering how many Muslims were born and raised here in Winnipeg,” she said.